Professor Ram Karan Sharma is a Sanskrit poet and scholar. He holds degrees in Sanskrit, Hindi, Sāhitya, Vyākaraṇa and Vedānta. He was awarded a PhD in Linguistics in 1959 from the University of California, Berkeley, under the guidance of Murray B. Emeneau. He was President of International Association of Sanskrit Studies from 1994 to 2006 and is now its Vice President. Professor Sharma writes in both Sanskrit and English. His literary works in Sanskrit include poetry collections and novels. He has also written on elements of poetry in the Mahābhārata and translated and edited books on Indian medicine, epics, and Purāṇas. 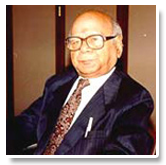 He has received numerous prestigious awards, including the Krishna Kanta Handique Memorial Award in 2006. He is a fellow of the Royal Asiatic Society (London) and Member of the American Oriental Society.